Home > Step 2 Finish Kare SIRR Steel, Iron Rust Remover/ Acid Based Cleaner 31 oz. Step 2 of the Finish Kare Paint Decontamination System. Finish Kare SIRR Steel, Iron Rust Remover/ Acid Based Cleaner deep cleans the sub-layers of auto paint to protect the paint from ferrous (iron-containing) particles. This preventative measure puts a stop to corrosion by neutralizing caustic compounds. No other method cleans paint as deeply as Finish Kare SIRR Steel, Iron Rust Remover. The Finish Kare Paint Decontamination System was developed as a method of removing paint contamination beyond what can be removed by washing or claying. If you are familiar with detail clay, you know it is capable of removing above surface contaminants that have bonded to the paint. The Finish Kare Paint Decontamination System is designed to remove what lies below the paint surface. Finish Kare SIRR Steel, Iron Rust Remover/ Acid Based Cleaner is Step 2 of the Finish Kare Paint Decontamination System. Step 1, Finish Kare 1119 Soil and Coating Remover, removes surface soil. Since paint contaminants penetrate below the surface, Finish Kare SIRR Steel, Iron Rust Remover opens up the paint's pores to release ferrous particles and to neutralize caustic compounds that have developed in the paint's subsurface. Ongoing damage is immediately stopped and future damage is prevented by removing the ferrous particles. To use Finish Kare SIRR Steel, Iron Rust Remover/ Acid Based Cleaner, apply it undiluted to the paint using a wash mitt. (Use a different mitt than the one used for Step 1.) Keep the surface wet. Work in Finish Kare SIRR Steel, Iron Rust Remover for 5-10 minutes using light pressure. Rinse the entire vehicle with cold water. Dry horizontal surfaces and inspect them. Use a cellophane glove or a plastic sandwich bag over your hand to feel for impurities. If paint feels gritty, repeat Step 2. 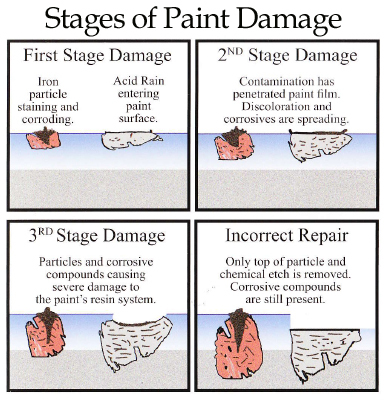 It is very important to follow all four steps in the Finish Kare Paint Decontamination System in their prescribed order. The sequence of alkaline, acidic, and neutral cleaners helps counteract the effects of the paint contaminants. The Finish Kare Paint Decontamination System is used by body shops for pre-cleaning prior to detailing and by dealerships for new and used car prep. It is proven to deliver a clean, glassy smooth vehicle that is protected from the harmful effects of paint contamination. No other is as fast and effective at removing multi-layer paint contamination. Remove paint contamination from deep within the paint with Finish Kare SIRR Steel, Iron Rust Remover/ Acid Based Cleaner. CAUTION: Finish Kare SIRR Steel, Iron Rust Remover/ Acid Based Cleaner is for professional use only. Protective goggles, gloves, and clothing should be worn, and a first aid kit should be available in case of accidental contact.